It's 8 in the morning and I'm at flight camp for high school students in Georgia. 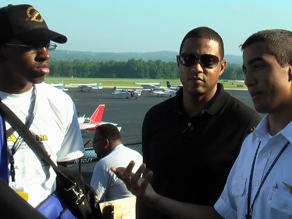 Most of the students are black teens who claim a real passion for flying. In just a few minutes I get to accompany 17-year old Brandon Henry on his maiden voyage behind the flight controls. He doesn't seem nervous at all, but I certainly am. I have not eaten breakfast. He offers me peanut M & M's. I don't think it's such a good idea to eat right now. Brandon is a remarkable young man. I admire his passion and commitment to flying at such a young age. What an incredible opportunity. And it made me think about where I was at his age. A training program like this for minority teens wasn't an option for me in the 1970's in my small Louisiana town. Instead of training to be a pilot or an astronaut or a journalist, at 17 I was trying to not make the same mistakes that some of my older male relatives had made; drugs, babies, jail. There's not much to do in a small town but get into trouble. Also by 17, I had become quite adept at navigating between three different worlds; the light skin black world, the dark skin black world and the white world. Most southern blacks are very familiar with this. But more about that later. Don't get me wrong, I came from a good family. Problem was that some of my peers did not. But, my grandmother watched me like a hawk. She was my and my two older sister's babysitter and co-parent for much of our youth. "Where are you going?" "Who's that boy's people?" "Did you write that paper?" Those were the standard questions. I didn't appreciate it then, but boy do I now. THANK YOU MAME (pronounced mah-me), god rest her soul! My mother will tell you I idolized my grandmother. We watched daytime soap operas together. Even as late as high school my grandmother and I would have sleep overs at her house. We'd watch old black and white movies until the wee hours. We listened to late night radio shows. For hours we'd sit in rocking chairs on her front porch and watch the people and cars go by. Then we'd read bedtime stories together. Except, I'd read to her. She only had a fifth grade education. She died of Alzheimer's in 1998. I miss her every day of my life. My grandmother looked White. To this day we still aren't sure of the exact mixture of her race. Her mother died in child birth. Her husband, my grandfather was brown and of African and French descent. They had three daughters. The middle one is my mother. I have two sisters. My father died when I was seven. My mom remarried. He died 23 years later. My mother is my best friend. Mom, single at the time, chose an all Black, Catholic grade school for me where there was a substantial focus on "light skin" and "good hair." There I learned a respectable knowledge of reading, writing and arithmetic. More importantly I learned that not only did white people discriminate against black people; black people discriminated against each other. Skin that was lighter than a "brown paper bag" guaranteed entrance into Creole fraternities, sororities and historically black colleges and universities. Yes, the same HBCU's still exist today. In the Black community universities like Fisk, Spelman and Howard, among others, were openly referred to as "brown paper bag" universities. Darker blacks went to 'Skegee,' short for Tuskegee. It was, and still is, shameful. In my home town, the big highway with its parallel railroad track was the dividing line. The blacks lived on the west side. The whites, on the east side. We all shared the grocery store, bank, post office and such. That's where I first heard a white person call me a N***er. When we moved to a new home in a "white" neighborhood some parents refused to allow their children to play with me. On Sunday the Ku Klux Klan would hand out paraphernalia on the same street as my high school. The majority white high school had only been integrated a few years before I attended. I'm not sure how it happened, but while the Klan did its thing out front; inside, my classmates were electing me Senior Class President. Only the second in the school's history. Progress. But to this day I believe the South offers Americans a most accelerated lesson on race relations. The conundrum then was not fitting in with either the light skins or the dark skins or the whites. I had the light skin but i didn't have the "good" hair. Sometimes I could "pass" for a light skin, especially in the winter months when my skin would lighten up. But only if my sister applied a chemical blow out to my hair. It never lasted, and always turned my brown hair bright red. Of course there were the usual infractions from whites like getting pulled over by the cops because I was driving a nice car, getting followed around by security guards in retail stores, being ignored by restaurant and bar staff. Sadly I had to learn to accept it, even expect it. But it somehow cut to the quick when black people did it. It hurt me deeply. Hey, whose side are you on anyway? – is what I wanted to ask out loud. I never did. Turns out Brandon the flight student is from Louisiana too. Just listening to him talk about his town, his family, his friends, his neighborhood, I can tell not much has changed there. But much of the world around him has changed, and it's good that his family encourages him to explore it. Brandon's first solo flight, like both of our upbringings, was a little bumpy, but not bad. He admits he needs to work on his takeoffs and landings. Personal responsibility is important, but he wasn't discouraged. In fact he is inspired by those challenges. And he inspired me too. At that moment it hit me; being black in America can be rocky at times, to say the least. And as much as life in some ways for many of us has stayed the same, it has also changed in just as many other ways. The point is to keep going. Like Brandon you too can change the world by changing "your" world. Thank you Brandon. I don't think race is that big of a deal. Although I am technically biracial. My mother is 100% German she was born in Germany and my father's mother was a black women and my father's father was Native American and Scottish. I understand the whole biracial and proud complex. I think it is awesome. I however, although I guess technically I am only 1/4th African-American, I always have and will always identify as black. I am very light skinned, I have curly brownish blonde hair and green eyes. Me saying that I am black has nothing to do with me ignoring my white heritage, it is just how I identify myself comfortably, and with the knowledge that all African-Americans are essentially multiracial or biracial. Me saying I am black is still me saying I am white too, becasue all black people have at least a white grand parent or a white parent or great grandparent, as African-Americans we are a little bit of everything. I am black and proud. Issues like this should be addressed, I don't see why white or any other races think that they are being left out and not focused on. I think it benefits the black community to see something like this. There are a lot of Jews that run this country, yes they fought for what they have. Orientals have come to this country and built their little communities all over. Black people have come a long way look at communities like Prince George's county . There are plenty of black people making it. We want a lot more black people to be successful as well, the young ones in jail to know there are role models that are out there. Media always showing the bad not the good, is not benefiting black children. I make it a point to educate my children on the contribution that blacks of made to this countries past and present. and encourage other black moms to do the same. If you are concerned about the amount of blacks working at Atlanta airport, you do know a lot of black people live in Atlanta don't you? Are there a whole bunch of black people working at the airport in South Dakota? Brandon sounds like a wonderful young man and I'm glad he was given the opportunity to take part in learning to fly. In comparing what was available during high school for my siblings and myself and what is now available for my children, I think that all races have a host of opportunities we could not have dreamed of years ago. Our children are fortunate to have these opportunities and they are also fortunate to be part of hopefully the generation that will help get rid of the last vestiges of racism. In the 1960s and 1970s we thought we could but we didn't – now a new generation can try and if they are mostly like the Brandon's of this post I think there is a good chance they will succeed. Please tell me it wasn't the Democratic Party which initiated Jim Crow Laws in the southern states. By the way did anyone else think that AC plugging his upcoming piece in the middle of it was a bit….cheesy? It's not like he interrupted the program to tell everyone. LOL It was on commerical. I bet he had little choice in the matter anyway. Back when Soledad O'Brien had not been demoted to investigative reporter and was still morning anchor she participated in a q and a session with Rep. Cynthia McKinney. Not only was O'Brien rude and disrespectful; she did a hatchet job againgst another black woman. O'Brien is self-identified as black, is she not? It is not about which race has the head start for Africans are the oldest race on the planet and invented the footrace. No, rather this an issue that hinges on justice. It is about what happens when fathers provide genetic material for offspring but deny them their names and seats at the famiky table. Whenever children are denied by fathers you have hurt, hatred, and enmity. Thanks for sharing your story...love the way you keep it real on the Newsroom.One thing for sure,this documentary has got us all talking again and let hope some positive comes out of it. By the way did anyone else think that AC plugging his upcoming piece in the middle of it was a bit....cheesy? To Faye Rose: what does a "...white man..." report like? I grew up the only son in an Arab family in the middle of a Jewish neighborhood in Michigan. My high school was highly integrated, so much so that in the 1980's, I was president of the National Honor Society, on my senior class board, voted most popular and most likely to succeed – and all of this while I had a boyfriend. Being an Arab, being gay, being different were all part of the multi-cultural experience at a public school in suburban Detroit. I actually met Don a few years ago in Louisiana; I was dating a co-worker of his in the industry. He's a kind, smart, incredibly engaging, handsome man – a winning combination and an unstoppable force. While these assets may have helped Don become the successful, I've known many with equal attributes who are unable to rise above their situation. Don deserves our respect and admiration. My friends and I have been having a discussion of what gets lost in a post-gay world; nowadays the younger generation is going to mixed bars and in many ways, I believe we're being mainstreamed, and the danger in being mainstreamed is that you lose some truly critical and meaningful culture. I actually believe we're much closer to being post-black than post-anything else. Granted, it will take much longer for the South to catch up (and by south, I mean anything below Columbus, Ohio, where I've been living for the past few years). But remember all the clamor over black-white relationships? It's a non-issue now, here and on the coasts. What's my point? The white males who have been writing in about their disadvantages need to accept that we live in a world of relative parity. You have to own your failures just like you have to own your successes; we all have disadvantages. Those who choose to lean on their relative advantages, like Don, go far in this world. Those who compare themselves to everyone else only add to the odds stacked against them. Be your own advocate and (to quote Louis Pasteur) you'll find that chance favors the prepared mind. This guy is right on target. It's difficult to emulate something you have never seen. It's almost impossible to do it successfully a good majority of the time. When you don't have good role models, sometimes you don't even imagine what "could be.," you just accept "what is." I'm white ... but I'm going through the same thing as I struggle to be a good Father. I didn't have a Dad in the home – was raised by my Mom, Aunts, Grandmas and such – all women. I have to figure out as I go along, "how would a Dad respond" to this situation? I don't know. I've never seen it happen on a regular basis. And so making decisions, doing things that white Americans think are obvious - well, maybe they're not obvious. It's the responsibility of all communities to ensure children are raised properly. If not, we all suffer. It is impossible to deny that racism still exists in this country - people who say it does not just refuse to open their eyes to SOMEONE ELSE'S experience. However, discrimination among human beings will always exist. Even if we were all the exact same complexion, height, weight, etc as everyone else, people would still find something (anything!) to differentiate themselves on and display preferential treatment for - whether it be the length of your fingers or the shape of your chin. The bottom line is that bigotry begins at home. If we want the cycle to end, we must not impart this hate and prejuidice to upcoming generations. Parents, you have a responsibility to instill in your children love, respect and tolerance for ALL human beings, despite the inevitable differences that we have in culture, ethnicity, economy or anything else. I, for one, plan to teach my beautiful African-American sons that we as humans are all equal in the sight of God; and as long as they apply themselves and work hard that the sky is the limit for their dreams and they WILL achieve their goals; despite living in America or anywhere else!